WASHINGTON (Reuters) - U.S. Secretary of State Mike Pompeo will visit North Korea again next week to try to persuade it to abandon its nuclear weapons, and will take a new U.S. special representative, Stephen Biegun, with him in an attempt to break the deadlock. Pompeo on Thursday named the Ford Motor Co executive, a veteran Republican foreign policy hand, as the U.S. special envoy to North Korea. 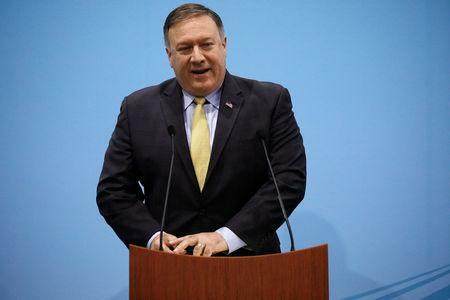 "Steve will direct U.S. policy toward North Korea and lead our efforts to achieve President Trump's goal of the final, fully verified denuclearization of North Korea as agreed to by Kim Jong Un," Pompeo told reporters, referring to the North Korean leader. "He and I will be traveling to North Korea next week to make further diplomatic progress toward our objective," Pompeo said. It will be Pompeo's fourth trip this year aimed at getting North Korea to scrap a nuclear weapons program that threatens the United States and his second since an unprecedented June summit between U.S. President Donald Trump and Kim that produced much fanfare but little obvious progress. U.S. State Department spokeswoman Heather Nauert said Pompeo had no plans to meet with Kim in Pyongyang. "We don't have that scheduled; we have no expectations of meeting with Chairman Kim. That is not a part of this trip," she told a regular news briefing. Biegun said of North Korea: "The issues are tough and will be tough to resolve." But he added that Trump had created an opening "that we must take by seizing every possible opportunity to realize the vision for a peaceful future for the people of North Korea." Biegun served as vice president of international governmental affairs for Ford for 14 years. Prior to that, he was a senior staffer for former President George W. Bush’s national security adviser, Condoleezza Rice, and he also advised members of Congress on foreign affairs. Trump hailed the summit in Singapore as a success and even went as far as to declare that the nuclear threat from North Korea was over, but Pyongyang has given no indication that it is willing abandon its arsenal unilaterally. Pompeo was charged with heading follow-up negotiations, but these appear to have made little progress, with the two sides apparently far apart on the fundamental issue of denuclearization and the U.S. demand for this before North Korea sees any relief from tough international sanctions. On his last visit to Pyongyang, in July, Pompeo left hailing progress, only for North Korea within hours to denounce his "gangster-like demands." He did not meet with Kim on that trip, although he did on his first two visits, which took place before the summit. In an interview with Reuters on Monday, Trump defended his efforts to convince Pyongyang to give up its nuclear weapons, saying he believed North Korea had taken specific steps toward denuclearization. He said he would "most likely" meet again with Kim. However, several members of the U.S. negotiating team said they had seen no sign that North Korea was prepared to negotiate seriously until the United States promised relief from sanctions in return. Some U.S. intelligence and defense officials consider Pompeo’s planned trip to be premature and said the prospects for significant progress appeared dim. Kelly Magsamen, a former U.S. deputy assistant secretary of defense for Asian affairs now at the Center for American Progress, said Biegun's appointment would "hopefully bring focus and coherence" to U.S. North Korea diplomacy. Joshua Pollack, a North Korea missile expert at the Middlebury Institute of International Studies, noted that Biegun's background was mostly in Russian issues. But Pollack said that Pompeo could enhance Biegun’s credibility as a negotiator by personally introducing him in Pyongyang. “That would allow Pompeo to step back somewhat until more groundwork has been laid in working-level talks,” he said. Biegun's name was floated earlier this year among a list of contenders to replace Trump’s then national security adviser, H.R. McMaster, who was ultimately succeeded by John Bolton. Biegun fills a vacancy that has existed since the late February retirement of Joe Yun, an appointee of former President Barack Obama and a strong advocate for diplomacy with North Korea. Soon after Yun’s departure, Trump embraced a diplomatic approach to Pyongyang that led to the June summit. North Korea state media last week blamed lack of progress on members of the U.S. negotiating team and said breaking the deadlock would demand "a bold decision on the part of President Trump." A commentary in its Rodong Sinmun newspaper said those opposed to dialogue were seeking to derail talks with baseless references to "secret nuclear facilities" in North Korea.